In Toon Boom Animate Pro, when you draw on a layer, the artwork is displayed in the correct order. For example, if the layer on which you are drawing is located behind an object on another layer, the lines you are drawing will be hidden behind that object. This option lets you display the selected drawing on top of everything while your draw. By enabling this option, each time you select a drawing tool, the selected drawing is displayed in front of everything in the Camera view. The Timeline and Network view ordering remain unchanged. 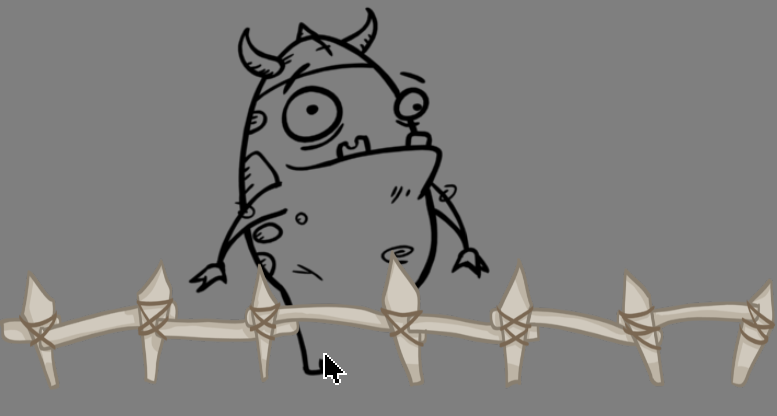 The Show Current Drawing on Top status (enabled or disabled) is remembered when you exit Animate Pro. When you restart the application, the last status will be used. 2. From the top menu, select View > Show > Current Drawing on Top. 3. 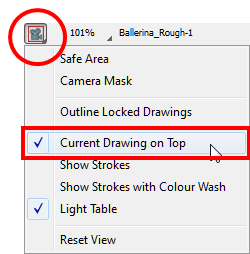 In the Camera toolbar, click the Camera Option button and select the Current Drawing on Top option. 4. In the Tools toolbar, select a drawing tool. 5. In the Camera view, start drawing. You only need to enable this option once, it is not necessary to do it each time you select a drawing tool.